Observed in an urban neighborhood, Nairobi, Kenya. December 2011. Chameleons are very well adapted to arboreal life. 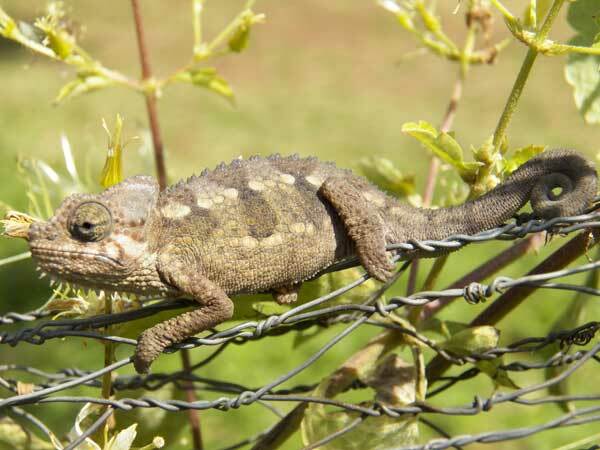 That this animal is able to navigate a slender wire atop a fence is evidence of a supreme balancing system and very strong muscles in the toes and legs. The tail is prehensile allowing it a tight grasp of a twig or vine. Color changes can aid camouflage or else warming from insolation. Copyright Michael J. Plagens, page created 17 August 2015.